On his “Awearness” blog, the fashion designer Kenneth Cole shares about his involvement in social causes, specifically what he refers to as the “four socially aware pillars of discussion: Social Rights, Well-Being, Political Landscape and Hard Times.” In 2007, he approached Melcher Media to publish a book that would convey some of the most poignant stories from individuals who have devoted their time to social causes. 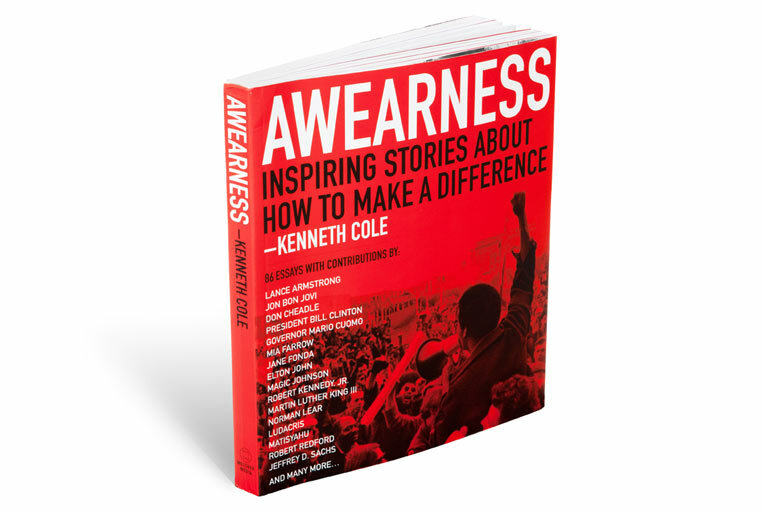 We wanted the look and feel of the book to mirror the earnest call to action of Cole and his Awearness partners and to express the passion the contributors have for their causes. At the same time, we wanted to pair these insightful personal stories with the surprising statistical facts. Teaming up with Kenneth Cole’s creative team, Melcher Media, and illustrator Andy Pressman, we art directed and designed the book to feel dynamic and relevant, using bold typography and clean page layouts to draw the reader’s attention from one poignant story to the next. Pictographs alert readers to sidebars and data; and photography is used to balance the typographic features and add a personal face to the issues. We created a fluid design that balances type, graphics, and photography, but respects the reader’s desire to engage directly with the activists’ words. For more about Awearness, visit the blog at http://awearnessblog.com/.